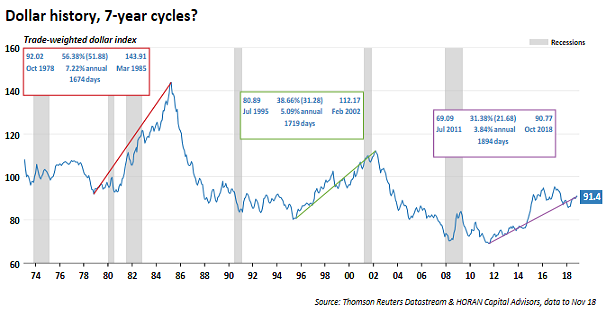 Investor sentiment continues a trend of turning less bullish. 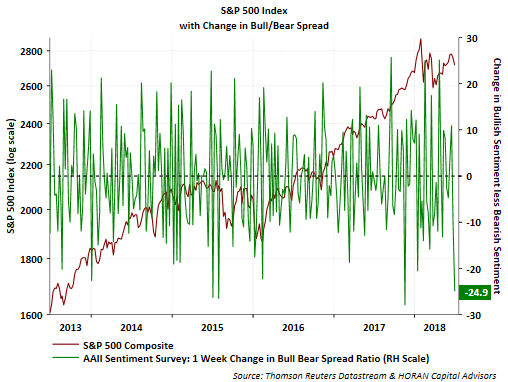 Today's Sentiment Survey report from the American Association of Individual Investors noted individual investor bullish sentiment decline 9.8 percentage points to 25.3%. 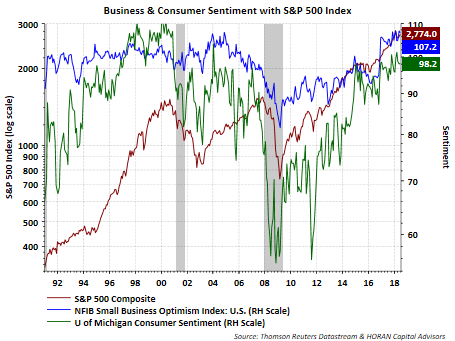 Neutral sentiment declined 1.3 percentage points with the result that bearish sentiment rose 11.2 percentage points. 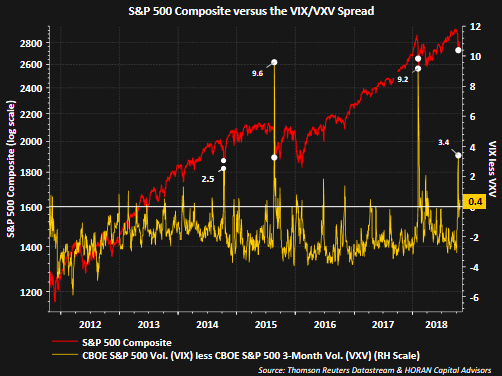 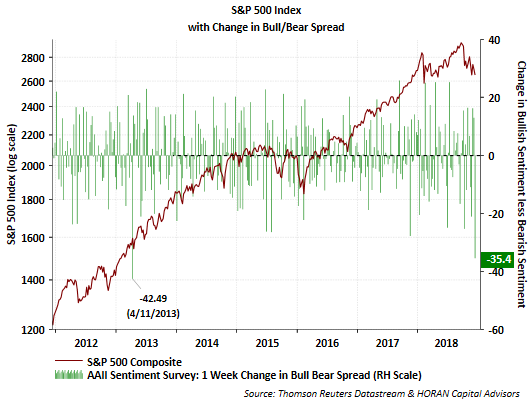 The net result is the bull/bear spread of -21.8 pp is the widest since the spread reached -29 pp in February 2016. 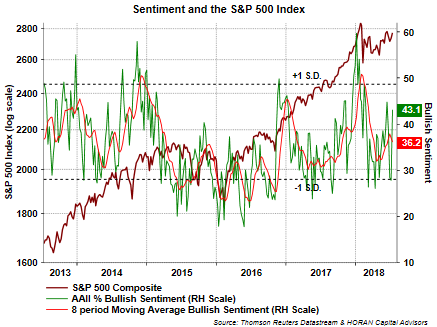 Today's Sentiment Survey report from The American Association of Individual Investors (AAII) is further confirmation that sentiment results are widely positive. 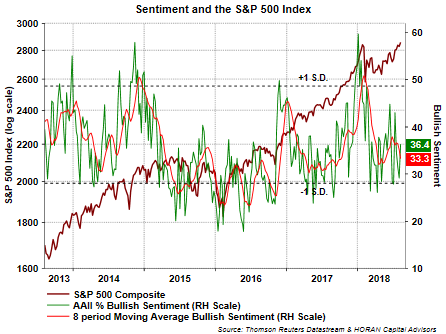 The AAII report shows bullish individual investor sentiment jumped 15.2 percentage points to 43.1% this week. 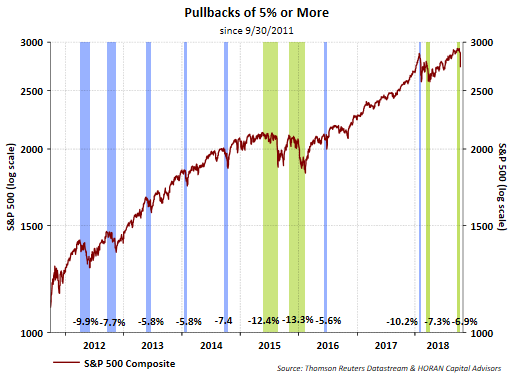 Ten percentage points came from a decline in bearishness of 10.1 percentage points and a decline of 5.1 percentage points in the neutral category. 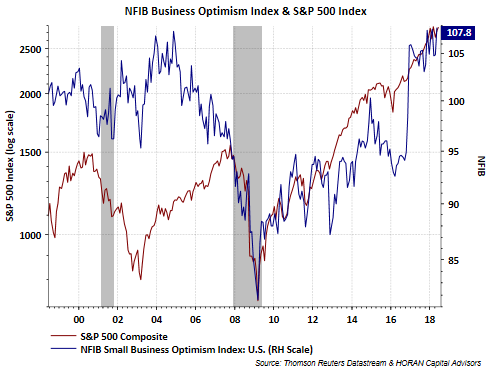 This improvement in sentiment coincides with other sentiment measures showing high levels of optimism as well. 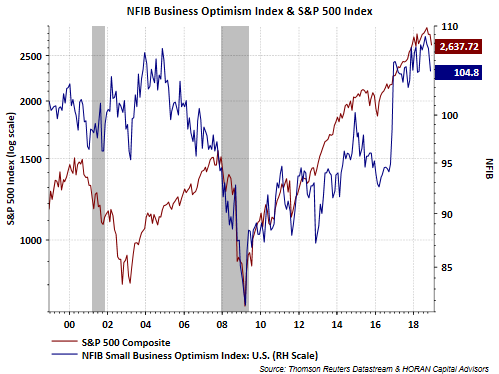 Yesterday we noted the near record high in the NFIB Small Business Optimim Index. 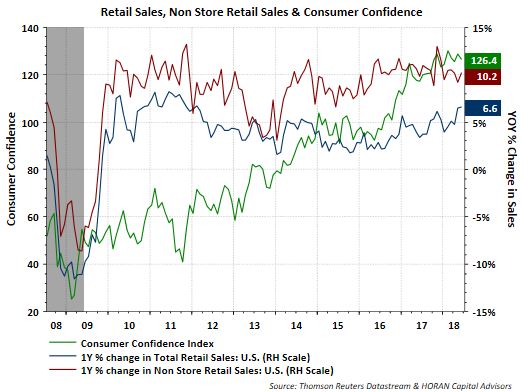 The consumer is optimistic as well with the University of Michigan Sentiment Index at a level that exceeds pre-financial crisis readings. 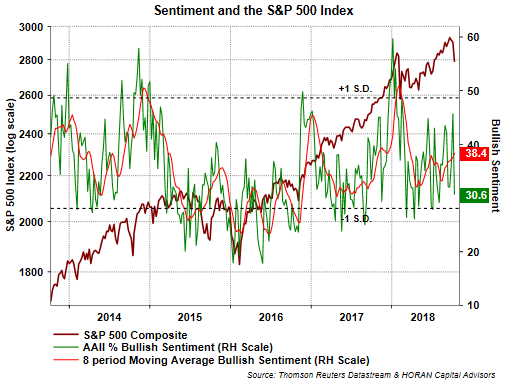 Sentiment measures tend to be contrarian ones, especially the AAII Sentiment Survey. 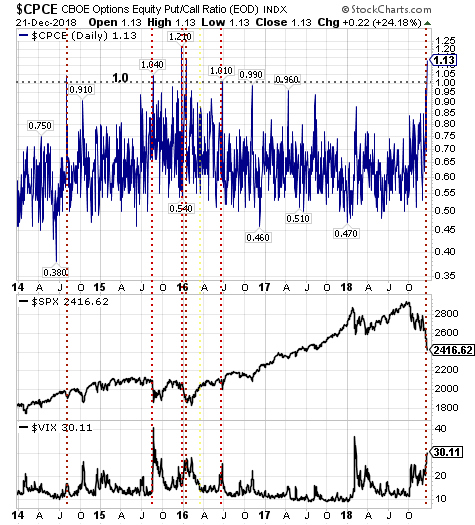 From a positive standpoint bullish sentiment is not at an extreme high, that is, at a level in excess of 50. 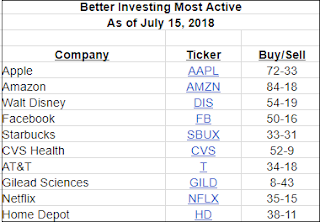 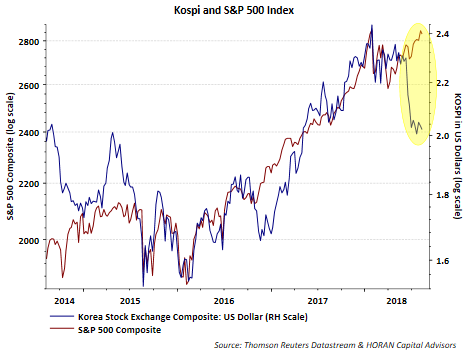 In and of themselves, these positive sentiment readings can serve as a tailwind for further positive activity both economically and and for the equity markets. 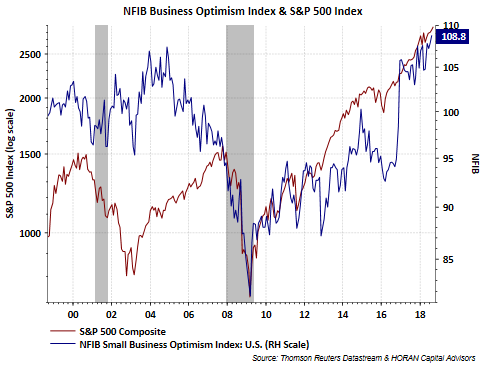 "The Small Business Optimism Index posted its sixth highest reading in survey history for the month of June, at 107.2, down 0.6 from May." 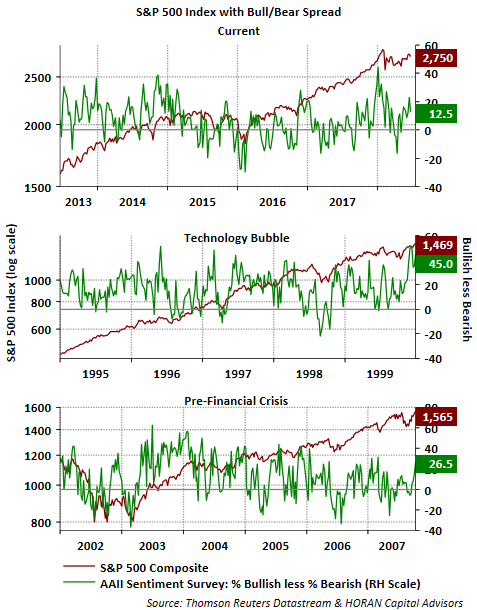 "Since December 2016, the Index has averaged an unprecedented 105.4, well above the 45-year average of 98 and rivaling the all-time high of 108.0 in July 1983." 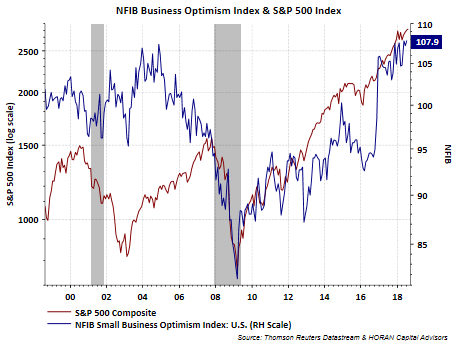 Juanita Duggan, NFIB President and CEO stated, "Small business owners continue to report astounding optimism as they celebrate strong sales, the creation of jobs, and more profits. 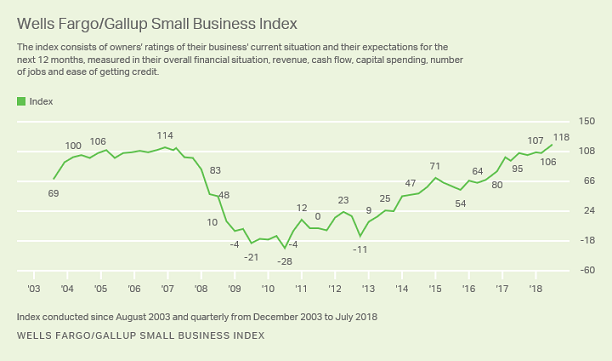 The first six months of the year have been very good to small business thanks to tax cuts, regulatory reform, and policies that help them grow." 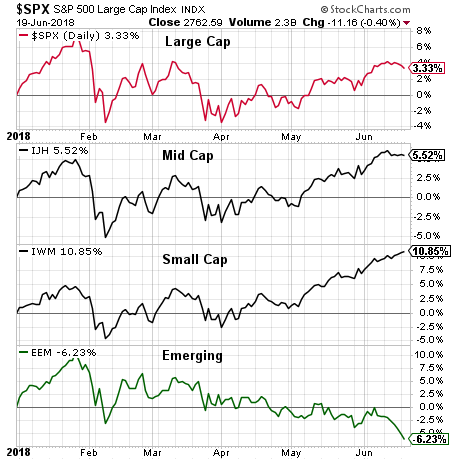 The economy is not the stock market and vice versa, but positive economic data tends to be supportive of a positive equity market environment. 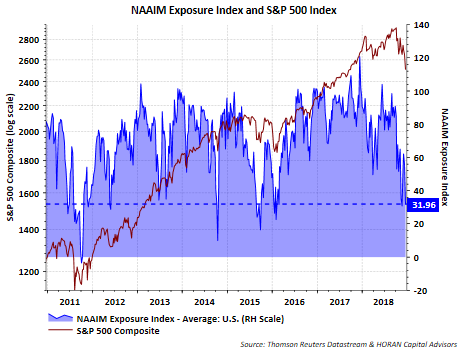 The current environment seems a bit like a Goldilocks one and that might be a cause of concern for some. 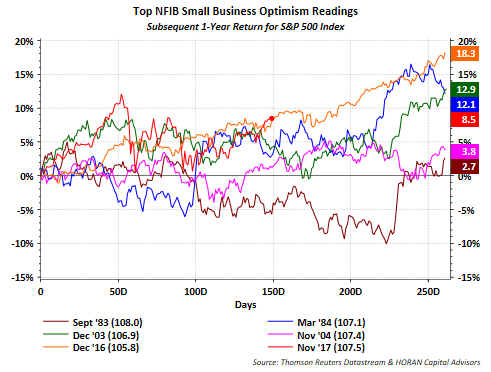 If one is a writer for business publications it is difficult to find a great deal of negative news. 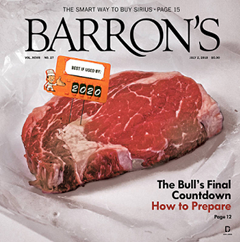 To that end recent articles are focused on predicting a recession and end to the bull market in 2020. 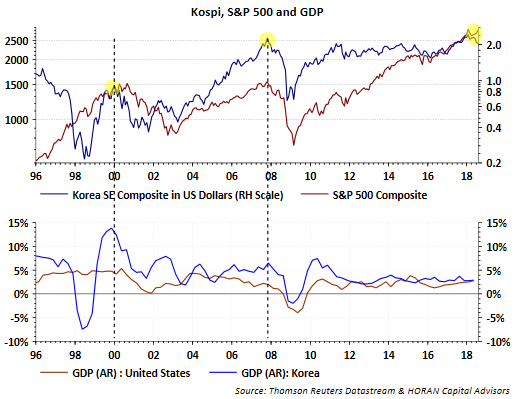 Predicting the end of the equity bull market a few years into the future is something of a stretch when economists and strategists are unable to accurately predict economic growth (GDP) for the next one or two quarters as highlighted in our Summer 2018 Investor Letter. 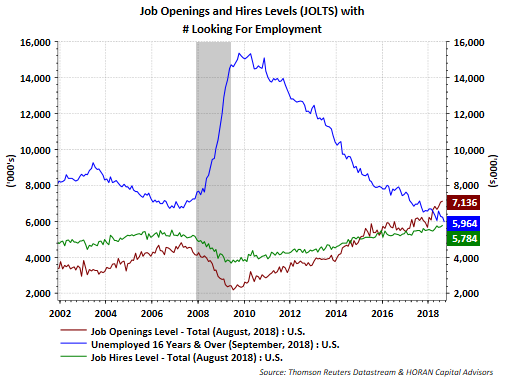 Our current Letter comments on the hunt for bad news in spite of what seems like a strong underlying economy. 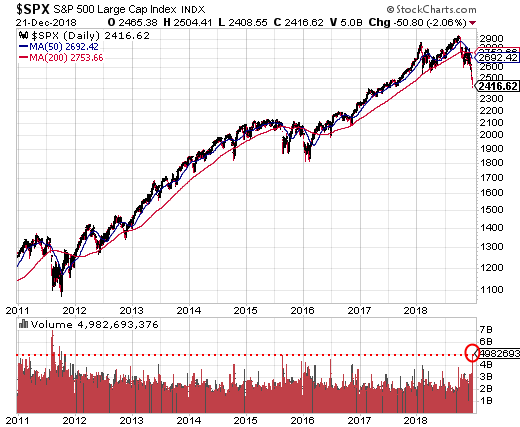 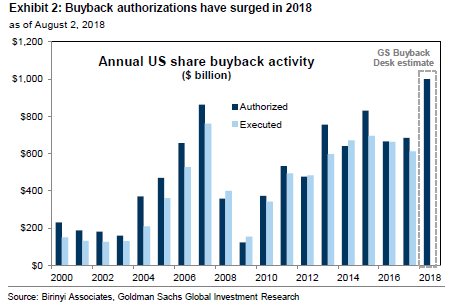 We discuss issues that could derail the expansion, but the economic and market environment looks sound at this point in time. 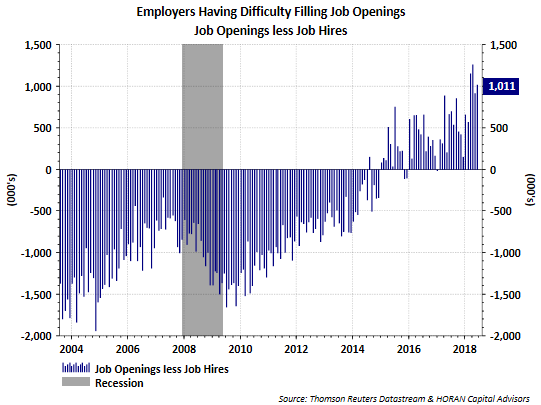 Today's employment report was strong as nonfarm payrolls increased 213,000 and beat expectations of 190,000. 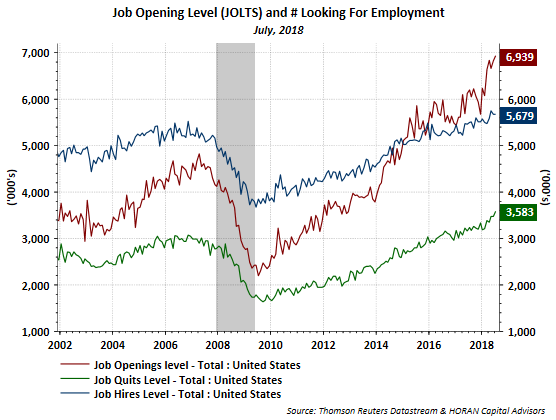 The prior month's report of 223,000 jobs was revised higher to 244,000. 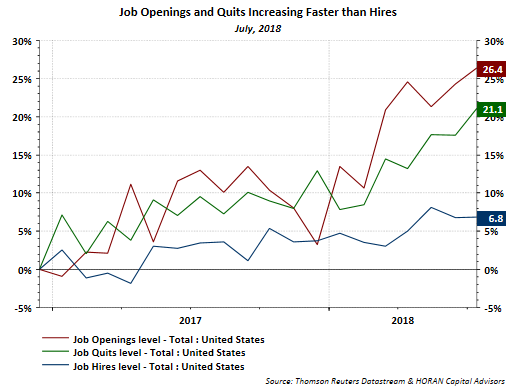 In short, a strong jobs report. 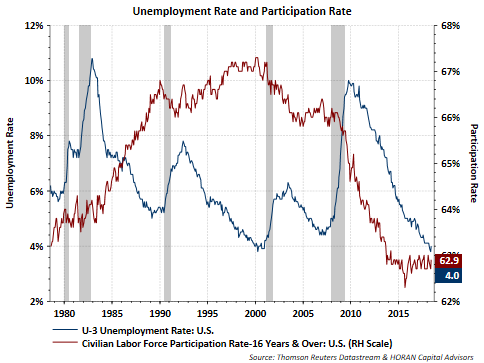 A positive in the report was the increase in the participation rate to 62.9% versus the prior month's participation rate of 62.7%. 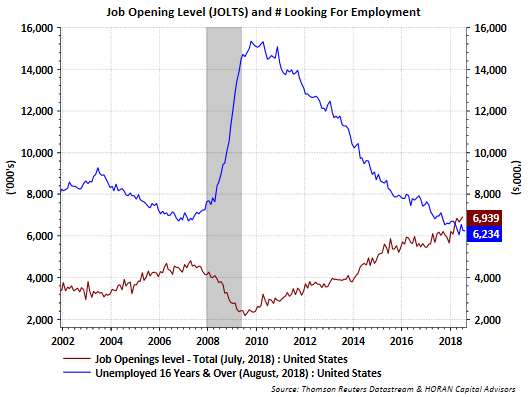 The number of unemployed actively looking for jobs jumped 499,000 to 6.564 million. 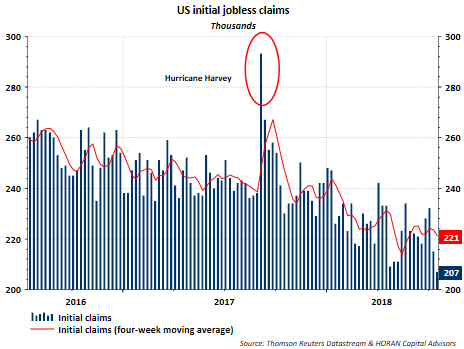 Because the change in payrolls was smaller than the change in the number actively looking for a job, the unemployment rate increased to 4.0% from the prior month's rate of 3.8%. 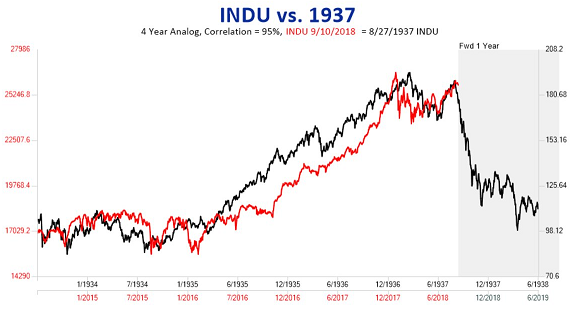 So far in 2018 the Dogs of the Dow investment strategy is a losing one relative to the return on both the Dow Jones Industrial Average and the S&P 500 Index. 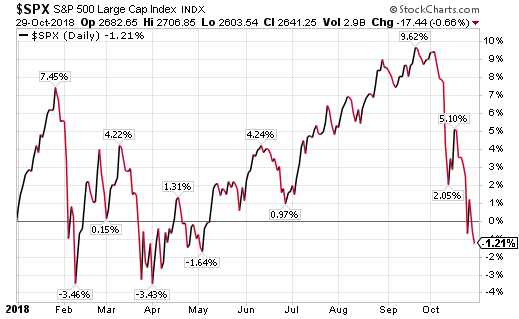 Through the close of business on July 3, the average return of the 2018 Dogs of the Dow equals -3.8% on a price only basis and -2.0% total return. 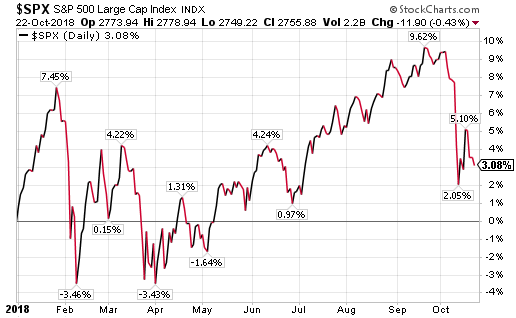 This compares to the price return for the Dow Index of -2.3% and total return of -1.4%. 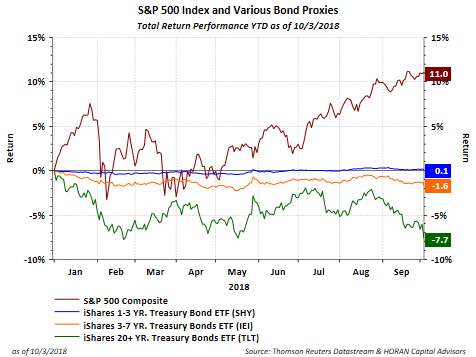 For the S&P 500 Index, both the price only return and total return are both positive on the year. 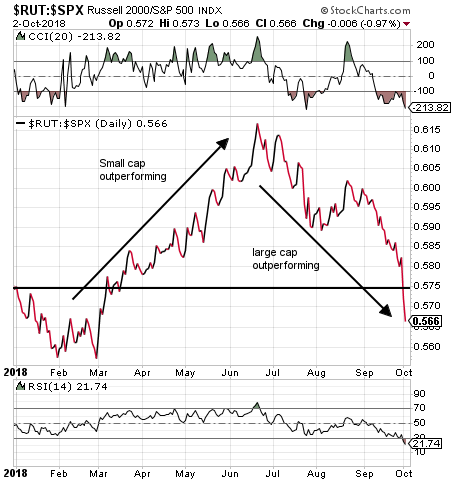 Thursday this week markets will get another look at oil inventory levels with the release of the weekly EIA Petroleum Status Report. 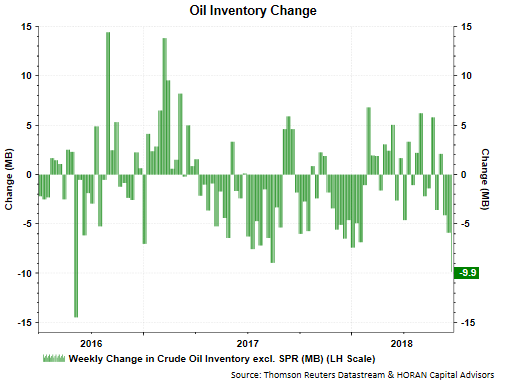 The past few weeks have confirmed strong declines in oil inventory levels. 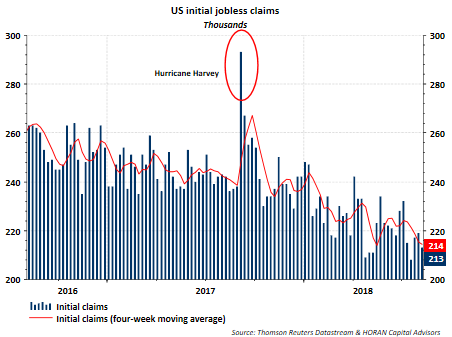 Last week's draw-down was 9.9 million barrels and the prior week saw a contraction of 5.9 million barrels. 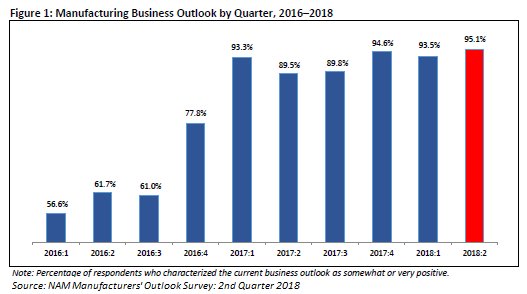 With last week's final reading on first quarter GDP, the Bureau of Economic Analysis provides a final review of the National Income and Product Accounts (NIPA). 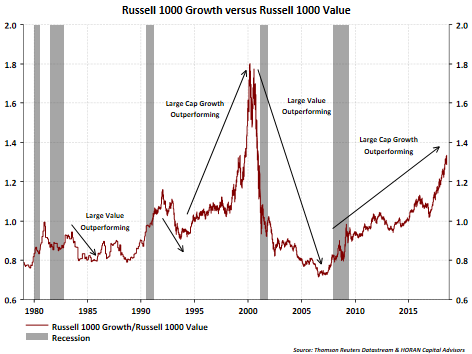 One category worth evaluating is the corporate profits figures. 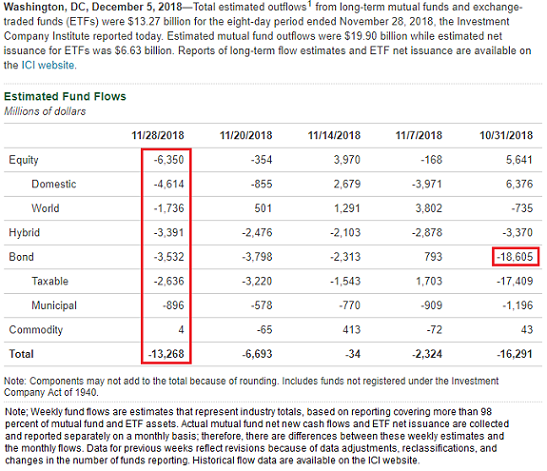 Corporate profits from the NIPA tables are true economic profits from IRS data and not simply profits based on GAAP. 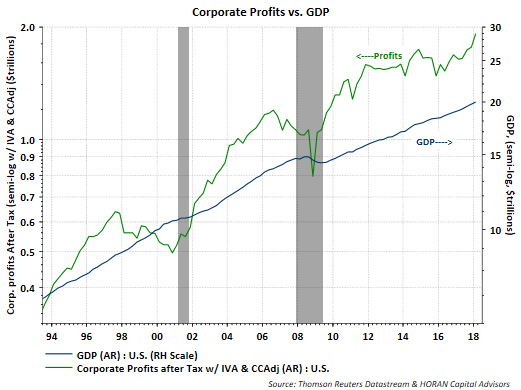 In the final GDP report last week, corporate profits with IVA & CCAdj totaled $1.92 trillion at a seasonally adjusted annual rate versus $1.64 trillion in the same period a year earlier. 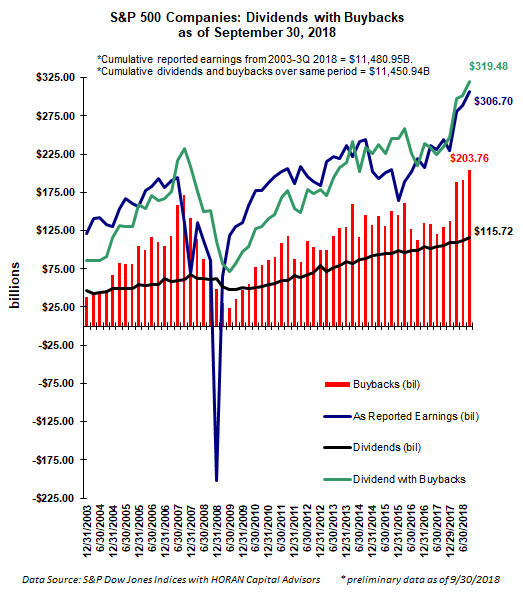 This represents a nearly 17% increase in profits from a year earlier.